Wednesday, 30 January 2019, 7:41a.m. The dispute is over the SPF (sun protection factor) rating of one of what the society says is one of its most important sunscreens - SPF 50+ Kids Pure sunscreen. The Cancer Society says it is in a dispute with Consumer NZ over testing of SPF 50+ Kids Pure sunscreen. Cancer Society Chief Executive, Mike Kernaghan told Kate Hawkesby after initial testing they were told the sunscreen didn't meet the requirements. "We were advised just prior to Christmas, that our Kids SPF 50+ Pure sunscreen had not met the SPF 50 claim on the label and that they had returned an SPF of 41." "In an effort to resolve the matter, the Cancer Society asked Consumer NZ to join it in having the product tested in a mutually agreed laboratory totally independent of either organisation," the society said in a written statement. "Consumer NZ declined, saying an additional test on the Cancer Society's product would be unfair to other companies." The Cancer Society then carried out the test which came back with a result of SPF 60, which meets the requirements for the claim of 50+. However, Consumer NZ said they would still be printing the initial report saying the sunscreen didn't meet the requirements. "On engaging with Consumer NZ last week when we had a meeting with them, they still maintain they were going to print the report saying that we had failed to meet the claim on the label. So we were a bit disappointed with Consumer NZ." Kernaghan said he couldn't comment on how the first and second tests differed, but said they believe the product may have been compromised. "In the consumer test, the product was decanted into another container here in New Zealand prior to transportation to Australia for testing." "We maintain that has the potential to compromise the effectiveness of the product, because our sunscreen is manufactured in Australia where it is classed as a medicine, and the containers of sunscreen are specifically designed to ensure the sunscreen maintains its effectiveness over a three year period." "We are saying that if it does go into another container it has the potential to compromise it." He said Consumer NZ's response to the request for further testing was "disappointing". "I would have thought it was in everyone's best interest to make sure that our sunscreen does meet the claim on the label." 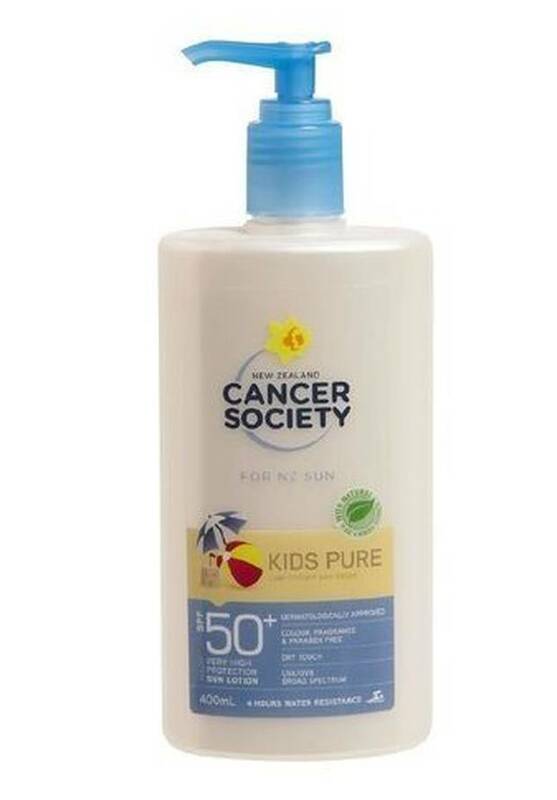 Earlier, Consumer NZ chief executive Sue Chetwin said its test of the Cancer Society's Kids Pure Low Irritant Sun Lotion SPF50+ showed it provided high protection (SPF41), but not the very high protection claimed. "We provided the opportunity for the Cancer Society to send us its own test results for the product. It provided results for a three-person test, not the full 10-subject test we'd expect given the difference we found in the product's SPF." Chetwin rejected the Cancer Society's claim that Consumer NZ's results were compromised by the fact it decanted the sunscreen into a light-proof container before sending the sample to the lab. "It's common for samples to be sent blind in this way and the sunscreen was packed according to the lab's instructions," she said.